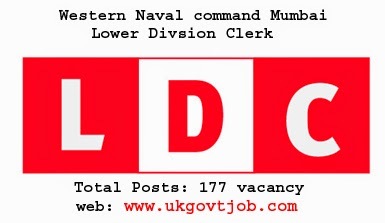 Western Naval command Mumbai 177 posts of Lower Division Clerk /LDC recruitment 2014: Online application has allotted for the Mumbai Clerk notification in Western Naval command. Eligible applicants can apply through this url www.irfc.nausena.nic.in for Lower Division Clerk in Mumbai Western Naval command 2014. Start date of application form is 19 August 2014 to till date 3 September 2014. More Information: age limit, what is pay scale for LDC in Mumbai Western Naval command Mumbai, application process fees, hall ticket download, exam date, examination syllabus and exam pattern and how to apply online are mentioned below. Selection process: online written test and skill test and interview.